The First World War, 1917 revolutions, and Russian Civil War shocked Jewish communities in Eastern Europe spiritually, politically, and materially. For the nascent Polish Braslev Hasidic movement, the events of 1917 and their aftermath severed the group from its Holy Place: the grave of Reb Nakhmen in Uman, Ukraine. This geopolitical reality elicited a unique literary and spiritual response in the form of an impassioned prayer, penned by Reb Yitskhok Brayter (c. 1886-1942), a leader of that community. The prayer, written mostly in Hebrew but shifting into Yiddish at critical junctures, narrates an expansive vision of history in which the Braslever Tsaddik, as well as his physical resting place, are crucial for redemption. Arriving at his historical present in which the Holy Place has been cut off, Brayter confronts God—most notably, in Yiddish. Across this messianically charged text, Brayter grapples with God’s concealment in history and the absence of the Holy Place, ultimately positing the possibility of prayer to overcome both. I wish to dedicate this piece to my father, Moshe Itamar ben Sara Rivka. I extend my thanks to the Schocken Institute for Jewish Research in Jerusalem for use of archival material there, and its staff; to Reb Shmuel Tefilinski for generously sharing his knowledge; to Naftali Ejdelman and Layzer Meshulovin for reviewing my translations; and to Rabbi Dr. Ariel Burger, for introducing me to Brayter’s world. Reb Yitskhok Brayter was born to a Hasidic family in Lublin. 1 1 See Sefer She’erit Yitschak: VeHu Sipur Chayav… veKovets Ma’amarav… shel… Reb Yitschak Brayter (Jerusalem: Agudat Meshech haNachal, 2009), 203-221. According to the Braslev tradition, he was identified by the Nazis as a Jüdenführer (“Jewish leader”) and was among the first sent to Treblinka; see She’erit, 24). 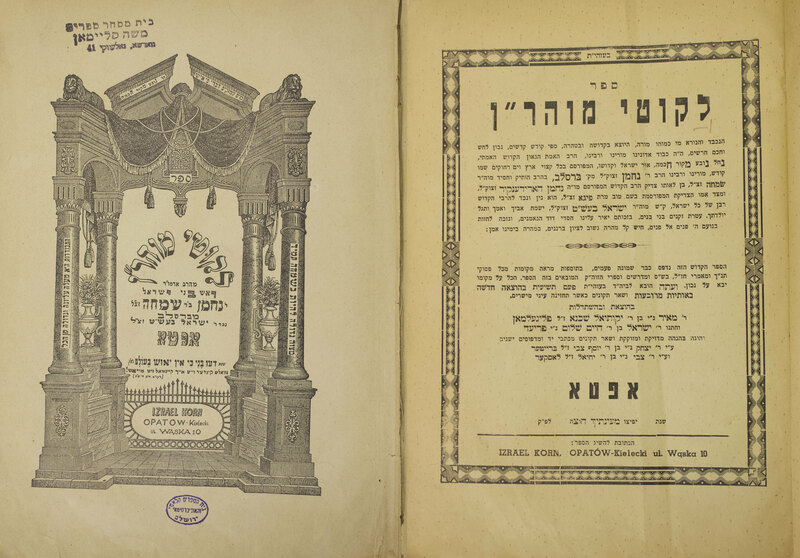 As a young man studying in the library of Reb Tsadok haKohen of Lublin, he came upon a copy of Likutei Moharan, the collected teachings of Reb Nakhmen of Braslev, 2 2 This place name has multiple transcriptions and spellings. In most English academic works, it appears as “Bratslav” or “Bratzlav,” the Ukrainian name. Local Jews called it “Broslev,” while the Polish Hasidim called it “Braslev.” Given the provenance of the text at the heart of this essay, I have opted here for this latter pronunciation. then unknown to him as to most Polish Jews. 3 3 On the obscurity of Braslev in Poland until the 20th century, see e.g. Moshe Krone, “Pesach im Chasidei Bratslav,” HaTsofeh, 13 Nisan 5703 (1943). Deeply impacted by the text, Brayter traveled to the Braslever’s grave site in Uman (now, Ukraine) for Rosh Hashanah. 4 4 Uman is the site of the annual Rosh Hashanah (new year) pilgrimage, and the locus of mythic rectifications central to the Braslev imagination. R. Nakhmen chose to be buried in the old cemetery in Uman, where thousands of martyrs from a 1768 massacre lay. In the months before his death, he made a number of statements about the rectifications his burial site would effect—for the souls of the dead, and for the living. RN famously promised that whoever would come to his gravesite, give a coin to charity for his soul, and recite the ten chapters of Psalms (the Tikkun ha-Kelali)—“even if his sins are very great”—he would pull him out of deepest hell “by his peyes.” See R. Noson Shternhartz, ed., Hayey Moharan (Leshon Tsadik; place and date unlisted), §225; and Zvi Mark, The Revealed and Hidden Writings of Rabbi Nachman of Bratslav: His Worlds of Revelation and Rectification, trans. Yaacov David Shulman (Jerusalem: Magnes, 2015), ch. 4, esp. 177-190. For literature on the gravesite and surrounding rituals and beliefs, see list of sources in David Assaf, Braslev: Bibliographia Mu’eret (Jerusalem: Merkaz Zalman Shazar, 2000), 221-231, and Zvi Mark, “Tsaddik haNatun beLo’a haSitra-Achara: HaAdam haKadosh vehaMakom haTame,” Reshit 2 (2010, 112-146), 112, fn. 1; Arthur Green, Tormented Master: A Life of Rabbi Nahman of Bratslav (Tuscaloosa: University of Alabama Press, 1979), ch. 6, and Appendix; and Yakov Travis, “Adorning the Souls of the Dead”, in God’s Voice from the Void: Old and New Studies in Bratslav Hasidism, ed. Shaul Magid (Albany, NY: SUNY Press, 2002), 155-192. On the Tikun haKlali, see below. Upon returning to Lublin, he began to draw young peers into the fold of Braslev piety. This circle became the germ of what was to become a fast-growing and robust spiritual and social movement. 5 5 Polish Braslev has not been sufficiently researched—see Assaf, Bibliographia, 13, and Jonatan Meir, “Shir Yedidot leRabi Yechiel Mendel mi-Medvedivka,” HaTfilah beYisrael: Hebetim Chadashim, ed. Uri Erlich (Be’er-Sheva: Universitat Ben Gurion, 2016), 203, fn 70. For existing research, see Mendel Piekarz, Chasidut Polin bein Shtei haMilchamot uviGzerot Tash-Tashah (‘HaShoah’) (Jerusalem: Mosad Bialik, 1990), 340-341; Asaf, ibid, ch. 13; and Meir, ibid, 191, 203-206. Amid the great political, social, and religious upheavals of the interwar period, the Polish Braslevers drew upon the teachings of Reb Nakhmen, reformulated them into concise and potent statements, and translated them into radical action. Part of a family portrait: Brayter and his son. Courtesy of Ginzei HaNachal Institute. The Braslev movement in interbellum Poland was a novelty—not only against the backdrop of local Polish Hasidic groups, but also vis-a-vis its senior Ukrainian sister. The latter, based in most of the same locales as in the lifetime of Reb Nakhmen, was informed by a tradition of careful oral transmission dating back to the beginning of the movement. 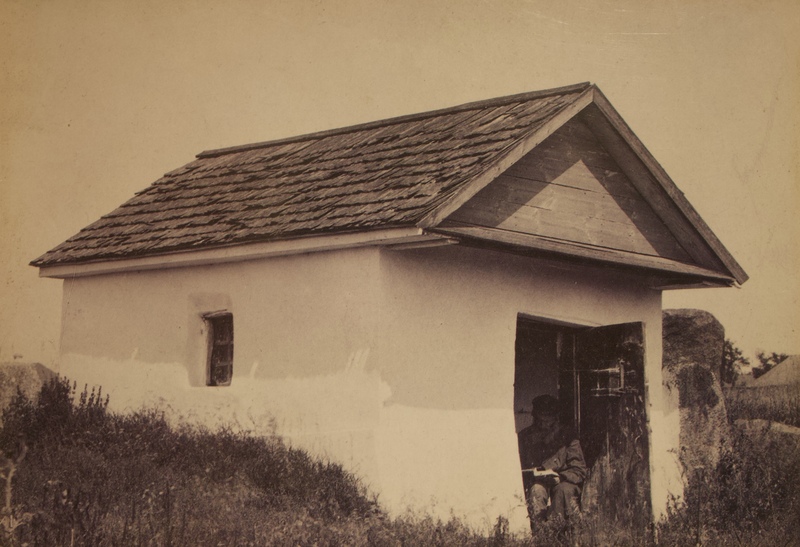 At the same time, hostility from neighboring Hasidic groups kept the Ukrainian Braslev movement introverted. The younger Polish Braslev movement, in contrast, read and drew on the established Braslev texts in a very different context and in new ways. For the most part, the Polish Braslevers dwelled in the large cities of Poland—in particular Warsaw, an overnight ‘Jewish metropolis’ of bewildering diversity. 6 6 See Glenn Dynner and François Guesnet, ed., Warsaw. The Jewish Metropolis (Leiden: Brill, 2015), esp. introduction, and ch. 5. There, amidst the crush of pedestrians and tramcars, 7 7 The realities of modern city life made need for innovative adaptations. See the comment of Heschel, who for a period of his adolescence joined the ranks of the Braslevers of Warsaw: Abraham Joshua Heschel, A Passion for Truth (New York: Farrar, Straus & Giroux, 1973), 215, fn. 2. the Braslevers prayed, learned, and danced ecstatically. 8 8 There are quite a few remarkable accounts of these dances, in particular from external sources. See e.g. Krone, “Pesach;” Chemjo Vinaver, Anthology of Hassidic Music (Jerusalem: The Jewish Music Research Centre, 1985), 258, 261; journalist Binyamin Davidzohn, quoted in Rikudim beMishnat Braslev (Mishnat Braslev leUvda uleMaaseh, 2015-6), 67-68, fn. 12). Green brought historian Emmanuel Ringelblum’s harrowing account of dances in the ghetto, as a coda to his biography of RN—the only mention of Polish Braslev in that work: Tormented Master, 266. See too Ariel Burger, Hasidic Nonviolence: R. Noson of Bratslav’s Hermeneutics of Conflict Transformation (PhD diss., Boston University, 2008), 5. There, the Braslevers came in contact with—touched, and were touched by—residents of Warsaw across the secular spectrum, including writers, artists, and political activists. 9 9 The most prominent, though uncommon, example was Hillel Zeitlin, a leading Varsovian Jewish cultural and political figure who became something of a “neo-Braslever.” See In geveb article about Zeitlin: Arthur Green and Ariel Evan Mayse, “‘“The Great Call of the Hour’: Hillel Zeitlin’s Yiddish Writings on Yavneh,” In geveb, March 8, 2016, https://ingeveb.org/articles/the-great-call-of-the-hour-hillel-zeitlins-yiddish-writings-on-yavneh; and Jonatan Meir, Yeriot v. 5: Rabbi Nahman of Bratslav: World Weariness and Longing for the Messiah—Two Essays by Hillel Zeitlin [Hebrew] (Jerusalem: Arna Hass, 2006). Some of the terms and structures—and arguably, something of the energy—of left-wing politics were also absorbed by the Braslevers, as the radicalism of the times took on traditionalist garb. 10 10 See e.g. Ayin Zocher (Warsaw: A. L. Cygielman, 1928), §17. For their part, the secularists were drawn by the dances of these followers of a dead Rebbe, as well as his enigmatic teachings and tales, which the Hasidim intoned. Some visitors came to the Warsaw shtibl (prayer house) on the Sabbath, canes in hand 11 11 See She’erit, 217. in public violation of Sabbath law, to observe from the sidelines. At times, the onlookers also became participants. 12 12 See Krone. In anthropological parlance, the onlookers straddled the line between edic and emic. For the impact of these encounters on a leader of Po’alei Zion-Left, see She’erit, 217. An interesting parallel case of influence of Braslevers on secular activists is the appropriation of the name “Kibbutz” by Labor Zionists in Palestine, from Braslevers they met there—see Yehuda Erez, ed., Sefer haAliyah haShlishit (Tel Aviv: ‘Am ‘Oved, 1964), 889. The Braslev shtibl thus acted as a liminal urban environment, a void that offered space for religious and social experimentation. 13 13 Scott Ury wrote about the Warsaw coffee house as a place of social experimentation and identity-testing in a new urban reality of dislocation. Scott Ury, “In Kotik’s Corner: Urban Culture, Bourgeois Politics and the Struggle for Jewish Civility in Turn of the Century Eastern Europe,” in Warsaw. The Jewish Metropolis, 207-226. Between its walls, and by virtue of the diverse individuals who visited there, and at times linked hands or exchanged words, the shtibl became a place for conscious and unconscious negotiations of the great social forces at work in early-twentieth century Jewish Poland: secularization, traditionalism, radicalism(s), politicization, and a Braslev counterpoint: apoliticization. 14 14 On the latter, see Brayter’s alternative to politics, in Oyfgemunterungs-Verter, esp. v. 1, translated to Hebrew as Divrei Hitorerut, in She’erit, 38-50. See also Krone’s comment about “politika.” It was an uncommon encounter, yet deeply expressive of its time and place: to paraphrase one historian, categorically Polish-Jewish, distinctly modern. 15 15 Moshe Rosman, “Categorically Jewish, Distinctly Polish: The Museum of the History of Polish Jews and the New Polish-Jewish Metahistory,” Studia Judaica 32, no. 2 (2013), 47–75. And [following Rosh Hashana of 1918] began the great dangers surrounding the Gathering in Uman—even from within the Ukraine—due to the bands of murderers, may their name be blotted out. Our folk 20 20 “Anash,” literally “people of our peace”, i.e. fellow members of one’s Hasidic group. from Poland endangered themselves repeatedly, with great self-sacrifice, with tremendous yearning and longing to come to Uman. But many were imprisoned, and their whereabouts were lost… So too, two [Hasidim] were killed, may God have mercy, on the border, next to the city Ostroha [Ostroh], as is known. 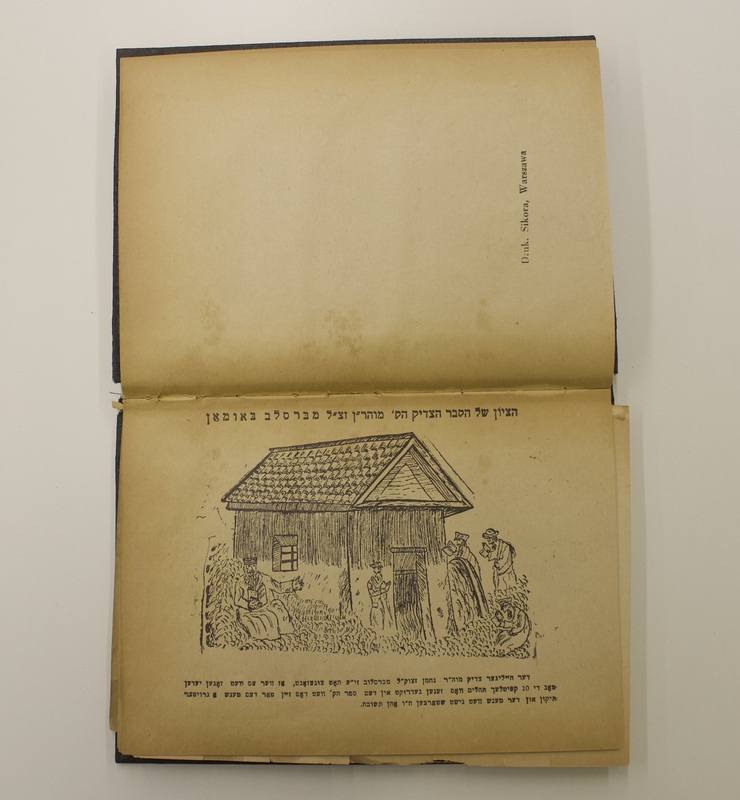 Since then, the way became very difficult, and the paths to Uman from Poland forlorn… 21 21 R. Yitschak Meir Korman, “Kruz al Rosh Hashana 5716”, §10, Bratslav Korman Collection, Schocken Institute. I am grateful to R. Shmuel Tefilinski for bringing this source to my attention. Although the paths to and from the heart of their world were closed off, the Braslevers of Poland continued to spread outward. They spearheaded a massive printing campaign, 22 22 By 1936, Tsigleman had printed 75,000 books. See the beginning of Dover Tsedek (Warsaw: A. L. Cygielman, 1933), for an extremely detailed account of what had been printed. taught extensively, 23 23 See e.g. She’erit, 145. and engaged in vigorous outreach. 24 24 See e.g. the end of the introductory “words of awakening” (possibly penned by Brayter), following the title page to the Warsaw edition of R. Moshe Yehoshua B’zshilianski (known as R. Alter Tepliker), Hishtapchut haNefesh (Warsaw: Prompol, 1919). In 1928, they established a substitute Rosh Hashanah gathering in Lublin, subsequently to be hosted with great fanfare by the world-renowned Hakhmei Lublin Yeshiva and its Rosh Yeshiva, Rabbi Meir Shapiro. Yet the yearnings for Uman continued to smolder. Young Polish Braslevers attempted repeatedly to cross the border into the Soviet Union, often risking their lives in physical defiance of the “decree.” 25 25 See the article from Undzer Ekspres, Aug. 26, 1937, above. Brayter, a leading voice in the movement—for whom the pilgrimage to Uman had been so formative—spoke out against such life-threatening ventures. 26 26 See e.g. his letter to a young Hasid—She’erit, 141-2. Instead, he modeled the possibility of spiritual resistance by means of prayer. 27 27 On spiritual resistance, see Burger, Hasidic Nonviolence, 2-6. See that dissertation for different forms of such resistance on the part of Reb Noson of Braslev. Specifically, Brayter composed two written prayers. These texts offered the Braslev community a meaningful way of responding to the crisis in a manner that was less tangible, yet in their eyes, directly impactful. One prayer was published in a small pamphlet in 1934 and distributed widely. 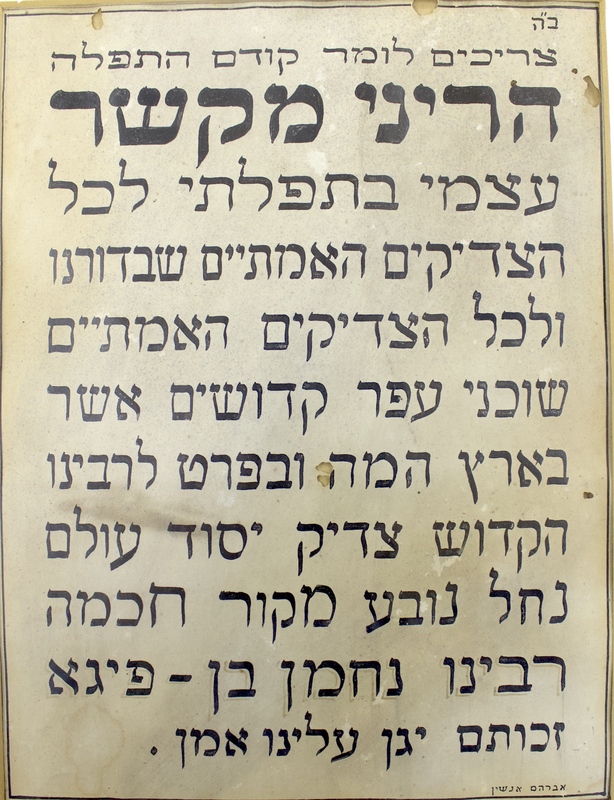 28 28 Prayer “to merit to… prostrate on the holy grave of our Master… in Uman,” in Tikun HaKlali [with commentary] (Warsaw: Bei Knishta Chada, 1934), 85-91; reprinted in She’erit, 166-169. A central theme in this shorter prayer is the rectification of the sexual, reflecting modern, interwar social realities. The second, entitled “Tfilah al Tikunei Rosh Hashana” (“Prayer Regarding the Rectifications of Rosh Hashanah”) is considerably longer, broader in scope, and more involved. The date of its writing is unknown, and, although clearly crafted as a text to be used by the Braslev community, 29 29 Beyond its careful textual construction, this is evidenced e.g. by the lacuna for the dedication of an unnamed sum for charity, near the beginning of the text. See below. Its only paratext is the title, which may or may not be the author’s. it remained unpublished for many decades. 30 30 See R. Noson-Zvi Koenig, ed., Nachalei Emunah (Tel Aviv: Arava, 1967), 82-91, and reprinted in She’erit, 156-165. A type-written copy of the prayer exists in the recently uncovered “Korman Collection” at the Schocken Institute, Jerusalem (Bratslav KC 4.1). Korman worked at the Institute after the war, and had hundreds of manuscripts—primarily letters from his correspondences with Polish Braslevers, and also texts like this prayer—transcribed. These transcriptions were deposited at the Institute and forgotten, until surfacing in 2016—while the originals (or many of them) were sold to Koenig, who published a relatively small portion of them, with some censorship. The existence of the remaining, unpublished letters was never disclosed. The remainder of this article is devoted to unpacking this understudied religious text, which grapples with the historical crisis of Uman’s closure and, as we will see, ultimately offers recourse to a new way. Pre-1910 photo of the Tsiyun the structure over Reb Nakhmen’s grave in Uman. R. Moshe Yehoshua B’zshilianski (known as R. Alter Tepliker) is seated in the doorway. He was killed by roving bands in the Russian civil war in 1919. An almost exactly identitical image appears in Horodezky’s “Rabbi Nachman von Brazlaw” (Berlin: Verlag von M. Poppelauer, 1910). Textual and literary analysis ought best to approach the text under consideration in a way that is attentive to the specificities of the text’s structure and content. In the case of Brayter’s prayer, we are dealing with a performative text that bears a clear narrative trajectory. 31 31 As we will see, Brayter’s prayer is largely structured as a narration of history, addressed to God. This echoes the novellae, addressed to God, in the Yad haK’tanah, which R. Nakhmen suggested as a literary model. See R. Noson Shternhartz, Sichot haRan (Warsaw: A. L. Cygielman, 1922), §145. The Braslev literature speaks of garbing (and in some contexts, cloaking) Tefilah (prayer) in Torah, and vice versa: see LM 5; Sichot, ibid; R. Noson Shternhartz, Likutei Tefilot (Warsaw: A. L. Cygielman, 1930), Introduction. See also CM, §387. These two modalities represent a two-way street of transmuting, while transmitting, meaning and content—wherein the writer communicates on overt and covert planes, with God as well as the reader. The text progresses and flows. For this reason, it will be of benefit to follow the course of the prayer, quoting important passages (translated into English), and charting textual and ideational developments. These include linguistic shifts: the prayer begins and ends in Hebrew but shifts to Yiddish at a crucial juncture. The textual transitions, along with a number of vivid images, lend depth and substance to the prayer, and will offer us vantage points for reflecting upon this remarkable text. 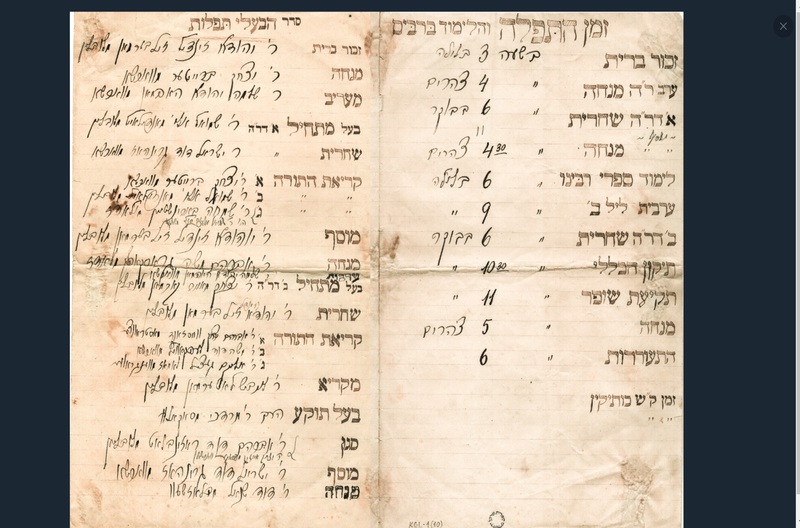 Hand-written listing of the times of prayer and the names of the prayer leaders for one of the Lublin Rosh Hashanah gatherings (in lieu of Uman). Brayter appears twice, as leader of the Mincha (afternoon prayer), the last prayer of the year, and Torah reading of the first day of Rosh Hashanah. Korman appears once, as leader of the first part of the second day’s morning prayer. KC-L-1(10), The Schocken Institute for Jewish Research, Jerusalem. But because of our sins, ‘God has done this in proportion to that:’ 37 37 Proverbs 7:14. the Accuser arose, and brought about the opposition of the Mitnagdim [“opposers” to Hasidism]… Also among the Hasidim, he caused ruin through subtle and spiritual ways, by raising up false leaders… in order to destroy the cosmic rectifications… 38 38 See the final paragraph of LM II 78. …Until God had mercy on His people, and in a way of concealment… sent [to the world] the True Tsaddik, God’s anointed, the root of the souls of Israel 39 39 The kabbalistic concept of a root-soul was intensively developed by RN, and appears frequently in Likutei Moharan. Brayter turned it into an article of faith in Chalukei Nachal §7. See also She’erit, 140. … our Master, Nakhmen son of Simkhe 40 40 This spelling out of the Tsaddik’s name is unique. Throughout Likutei Tefilot, RN is never mentioned explicitly, only alluded to through the veil of “the True Tsaddikim.” See Jonatan Meir, “R. Nathan Sternhartz’s Liqqutei tefilot and the Formation of Bratslav Hasidism,” Journal of Jewish Thought & Philosophy 24 (2016), 66-67. … to illuminate the earth, to remove [the imprisoned] from shackles… and opened a path of T’shuva for all the souls of Israel until the end-time; and there is not a one too maimed and degenerate who cannot find grace and place, hope and light, true knowledge and faith, through this Tsaddik. In truth, the Accuser acted cunningly to distance the world from him; but the power of this True Tsaddik is without end, for he is truly the ‘Tsaddik, foundation of the world,’ 41 41 Proverbs 10:25. See Green, “Zaddiq.” the simple element 42 42 The “quintessence” that gives rise to the four classical elements. See LM II 67. … He has full mastery of ‘running ahead and returning;’ 43 43 ‘Retso vaShov.’ This core Hasidic concept borrowed the language describing the movement of the angels, Ezekiel 1:14. RN said one must be baki, learned and well-versed, in drawing closer to God both from states of closeness and estrangement: “running” (further) and “returning” (LM 6:4). at his command are all the lights [in existence] ‘since God created Man on the earth,’ 44 44 Deuteronomy 4:32—read on Tisha beAv. And see following verse. and those which our righteous Messiah will [yet] reveal. And so we thank You… ‘Blessed is God who did not withhold from us a true redeemer…’ 45 45 Based on Ruth, 4:14. See the opening of Brayter’s “Song of Affection,” in She’erit, 198, and Meir, “Shir Yedidot,” 246. Here, Brayter renders in the boldest theological strokes a portrait of the Tsaddik of the Braslev imagination, his towering stature, and his limitless redemptive power. Even in the Braslev literature, such representation is exceptional. 46 46 See Brayter’s Chalukei haNachal §7, for what is arguably the pinnacle of such writing. History, of course, had not yet been redeemed. Sources suggest that Reb Nakhmen maintained acute messianic hopes, centering around his own figure and progeny, until a few years before his death at the age of thirty-eight. 52 52 See Mendel Piekarz, Chasidut Braslev: Prakim beChayey Mecholelah, biChtaveha uviSficheha (Jerusalem: Mossad Bialik, 1996), ch. 3; Green, Tormented Master, ch. 5; and Mark, Scroll of Secrets, ch. 1.2. The latter source is most germane here, addressing the students’ role in RN’s messianic project. On the central place of messianism generally in Braslev, see Hillel Zeitlin, “Messiah and the Light of the Messiah in Reb Nahman’s Thought,” trans. Alyssa Quint, in God’s Voice from the Void, 239-262. The opposition Reb Nakhmen faced from the Shpoler Zeyde (“Grandfather of Shpole”); the death of his infant son; and the onset of the tuberculosis he recognized at its outset to be terminal—all colluded in stifling his hope of imminent redemption. And yet, Reb Nakhmen did not do away altogether with these very personal messianic aspirations. Rather, he reconceived them as a messianic process—a spiritual war to be waged by his students, armed with his teachings. “My fire will smolder until Mashiach comes,” 53 53“Mayn fayrl vet shoyn tlien biz meshiekh vet kimen.” CM, §46. he promised his followers prior to his death; and he charged them to maintain it, and ultimately, kindle it into a conflagration that would encompass the world. 54 54 Mark, 71-73. This mission—to incite a spiritual revolution that would bring about the Redemption—lay heavily on the consciousness of Braslever Hasidim. None more so than for the Polish Braslevers, whose writings reflect an acute messianic consciousness. 55 55 See Meir, Yeriot, 26, fn. 164. The charge to redeem “Israel and the world” 56 56 “Kol Koreh,” Menachem-Av 5692 (1932), Bratslav KC, Schocken Institute. Interestingly, what might be the foremost example of a universal redemptive vision in interwar Jewish Poland was voiced by Zeitlin, the “neo-Braslever.” by means of the Rebbe’s teachings and “consciousness” finds its strongest voice in Brayter’s writings. 57 57 See Meir, ibid, 25-26. For Brayter and his colleagues, this was a core understanding of their historic role, and the defining project of their Judaism. And so, You decreed that this Tsaddik not finish the cosmic repair [tikun olam—i.e. the Redemption] in his lifetime—for it is part of Your hidden wonders… Therefore, this Tsaddik prepared all of the rectifications for the Messiah in his holy teachings and tales; 58 58 See CM §229, quoted in Mark, 71. and above all, he instructed all the souls of the House of Israel, all who seek the ‘general rectification’ [tikun ha-klali]—that is, ‘rectification of the covenant’ 59 59 The ‘covenant’ is a synonym for the phallus in the Zohar’s Divine body-map (see e.g. “Patach Eliyahu,” Tikunei Zohar, introduction)—and in Hasidic contexts such as this one, for its human analog—stamped with “the sign of the covenant,” i.e. circumcision. RN spoke in different contexts about the ‘general rectification’, in some places equating it with rectification of the sexual (“of the covenant”). This became correlated with reciting the ten chapters of Psalms. On the interconnection of these concepts, see Mark, Revealed and Hidden Writings, ch 4. See also Tikun HaKlali, introduction; L.M. 205, ibid II 92; Sichot, §141; Yehuda Liebes, “Ha-Tikkun ha-Kelali of R. Nahman of Bratslav and Its Sabbatean Links,” in Studies in Jewish Myth and Jewish Messianism, trans. Batya Stein (Albany: SUNY Press, 1993), 115-150. —to come to his holy grave and say there the ten chapters of Psalms… 60 60 On the ten chapters of Psalms, see above. On the Tsiyun as crucial for the Jewish people’s rectification and redemption, see sources in Mark, Scroll of Secrets, ch. 6, in particular Tepliker’s addendum to the Chayey Moharan manuscript, cf. 199-200. According to Brayter, Reb Nakhmen prepared the implements for redemption. 61 61 See fn. 35 above. At the heart of this messianic project, Brayter insinuates, are the grave in Uman, the ten chapters of Psalms, and rectification of the sexual. Through his mystically potent gravesite, Reb Nakhmen continues to act as a living force in history. This mention of the gravesite—in the context of a mythic and messianic narrative—lays a foundation to which Brayter will return later, when his prayer for the restoration of this holy place will reach the historical present. Hand-written transcription of the ritual utterance of “hitkashrut,” framed and on display at Ohel Esther, the Braslev shtibl in the Shaarei Chesed neighborhood of Jerusalem. It reads: “One must say before prayer: I hereby bind myself to all of the true Tsaddikim of our generation, and all the true Tsaddikim that dwell in dust, holy ones that are in the earth, and in particular to our holy Master, ‘Tsaddik, pillar of the world,’ ‘a flowing spring, source of wisdom,’ our Master Nakhmen son of Feyge, may their merit protect us, amen.” (Brayter’s prayer opens with a similar ritual utterance.) The name of the artist, Avraham Anshin, appears in small letters in the bottom right corner. It was a specifically Polish Braslev innovation to transcribe the performative utterance of “hitkashrut” and display it in a highly visible way. (See fn. 33.) My thanks to Ohel Esther. The defining moment of Reb Nakhmen’s life was his exclamation, months before his death, that “there is no despair at all.” 71 71 Also Green has read RN’s life in this way: Tormented Master, 265. For an account of the episode, see Sichot §153, and CM §49. The “Torah” that emerged is LM II 78. That moment, which Brayter casts as a revelation, a second Sinai, also defines the lives of the Hasidim. Indeed, this is their primary work. 72 72 RN’s teachings often contain parallel paths, for those of high attainment, and for “the fallen.” It was R. Noson who emphasized and privileged the latter path, which involved renouncing despair—and this became definitive of Braslev subsequently. See Burger, Hasidic Nonviolence, 35-39. The truth that despair is illusory is the asymptote towards which the Hasidim strive, and against which they are tested. This truth is “foundational,” the pillar of existence; it is revealed—and can only be revealed—by the “Tsaddik, Foundation of the World.” 73 73 See Brayter’s Chalukei Nachal, which opens with the “the foundation of foundations” of RN’s teaching—also relating to descent, despair, and prayer. There too, it is a “revelation” by the foundational Tsaddik—see ibid. §7. In the face of conditions that merit despair—in particular the falls of their own making—the students must “know” that despair is illusory. They are charged with “performing” this knowledge, actualizing it in the testing ground of life. The students are cast here as “shlukhim,” envoys of their Master. 74 74 The word “shalu’ach” appears later in the prayer. This concept is a major theme running through Brayter’s writings. Their mission is rich with mythic overtones. 75 75 Through RN’s Sipurei Ma’asiyot, “tales from ancient years,” mythic quests became central to the Braslev awareness. (See in particular Ora Wiskind-Elper, Tradition and Fantasy in the Tales of Reb Nahman of Bratslav (Albany: SUNY Press, 1998). The first story, “Of a Lost Princess,” in particular, resonates here. Through the telling of the tale, the individual’s experience is integrated into a “primordial,” that is, archetypal, and somehow familiar, narrative. This parallels Brayter’s contextualizing recent historical events into a cosmic metanarrative. The alternative to despair, as Brayter writes in the same breath as he narrates the fiery revelation, is hisboydedes, 76 76 Literally, “seclusion,” “secluding oneself,” in Hebrew; in colloquial Yiddish, it meant talking to God. See Moshe Idel, “Hitbodedut: On Solitude in Jewish Mysticism,” in Einsamkeit: Archäologie der literarischen Kommunikation VI, ed. Aleida and Jan Assmann (München: Fink, 2000), 189-212. the spontaneous personal prayer that is the core practice of the Braslev path. Amidst the throes of the storm, Brayter divulges very particular instructions for the practice of hisboydedes that concern the question of which language. Reb Nakhmen counseled practicing hisboydedes in Yiddish, the language in which a Jew of Eastern Europe could express himself 77 77 Use of the masculine pronoun is intentional: Reb Nakhmen said this to learned males, some of whom were highly well-versed in rabbinic Hebrew. freely, and the language that “pulls the heart.” 78 78LM II 25, which speaks of hisboydedes : “In loshn ashkenaz, in which [we] tell [tales] and converse [mesaprim umedabrim], it is easier and more possible to break one’s heart, for the heart is drawn and nearer to loshn ashkenaz.” As we shall see, the question of which language will be crucial in the textual drama at the heart of Brayter’s prayer. Hisboydedes happens, Brayter wrote, “from the [very] place to which one has fallen.” 79 79 See LM II 12. Like the Tsaddik who can reach the lowliest of people, hisboydedes bores to the deeps of existence. It reaches those who stand at the chasm of despair, offering unmediated expression to their experience. Sometimes that expression is as naked as a scream. 80 80 Forms of the word tsa’ak (“to scream”) are found in many of the sources on hisboydedes. Through it, the gaping nothing of God’s absence becomes something, and reality in the raw becomes humanized. 81 81 A psychoanalyst wrote, “Accomplishing what language does not readily do, the arts subjectify the outer world and objectify the inner…” Gilbert J. Rose, Between Couch and Piano (East Sussex: Brunner-Routledge, 2004), 2. I would argue that hisboydedes—including its verbal dimension—is art also in this sense. And that is a road out of despair. Until God had mercy on his people… and in a way of wonders and miracles, called the people of Poland to draw close to [Reb Nakhmen’s] ways, to learn his holy books, and He disclosed to them his venerable name, and also aroused their souls to travel to his holy gravesite; and they beheld what they could not fathom… Master of the World, how shall I take strength and words to thank You for Your great goodness, and for the pleasure we caused You with our holy sojourns [to Uman]—until his holy books spread forth, and his holy name went forth across the land… ‘This is the day we have hoped for’ 84 84 Lamentations 2:16—Brayter appropriates these words, spoken by the devourers of Jerusalem. … and we will say: ‘This one will console 85 85YeNaKhaMenu—sharing the same root as NaKhMen. us of our deeds and the sorrow of our hands from the land which God cursed’ 86 86 Genesis 5:29. since the sin of Adam and from all the sins of man upon the earth. Korman’s hand-written note, attached to the folder containing the copy of Brayter’s prayer. It reads: “Prayer Regarding the Rectifications of Rosh Hashana, of R. Yitshok Brayter.” The Schocken Institute for Jewish Research, Jerusalem. What is one to do, Riboyne shel oylem [Master of the World]!? Compassionate Father, what do You 102 102 Brayter uses the informal du (“thou”), as is the Yiddish norm when addressing God, creating an intimacy that the English “you”—and especially the capitalized “You” used here—fail to convey. want to bring about with this? Gevald [woe], what is one to do! How to draw mind and spiritual strength to cry out and to plead about this calamity?… Gevald, You know everything, but You want us to cry out with our mouths and our hearts… Riboyne shel oylem, You know our heart, how overfull of blood it is. There is no one to whom to turn; [even] the little bit of closeness to the Tsaddik, [achieved] through so many obstacles and opposition, You have also taken from us. What is one to do! ‘We won’t give You silence,’ 103 103 Based on Isaiah 62:7, demanding the restoration of Jerusalem. we won’t relent to You with our prayers, so long as sense and strength are in us, and the light of the Tsaddik still smolders 104 104 Brayter’s word, translated as “smolder”, is tlien—the same as in RN’s promise, “my fire will yet smolder until Mashiach’s coming” (Ibid, §46. See Mark, ibid., 72). Brayter references that statements, exhorting God to act before the remaining light decays and dies. in us. We will roar like lions, that You give us back the light of the True Tsaddik. 105 105 Echoing RN: “Though you are decent people, yet this was not my intention. I intended for you to be people who roar to God entire nights like wild animals in the forest.”” (R. Levi-Yitschak Bender, Siach Sarfei Kodesh, ed. R. Avraham Vaytzhandler (Jerusalem: Agudat Meshech haNachal, 1997), vol. 2, §120, 31; quoted by Mark, Scroll of Secrets, 70, fn 14—see messianic context there. Compare CM, §225). ‘For God did not decree to erase the name of Israel,’ 106 106 Kings II 14:27. God forbid… Riboyne shel oylem, give us back our holy Rosh Hashanah! We wish to go to the true Tsaddik! What will it hurt You? Does it not bring You the greatest pleasure? We are blind and mute, ‘from our feet to our head, no part of us is whole.’ 107 107 Based on Isaiah 1:6. We have no idea what to speak [in hisboydedes], at one moment we think good, a little light shines to us; and a moment later, ‘You gather up light before darkness…’ 108 108 Evening prayer, based on Berachot 11b. Remember God what has befallen us, 109 109 Lamentations 5:1. and what will befall us. Remember God that You won’t be able to have any pretensions towards us, without the light of the Tsaddik one cannot be a Jew, what kind of an accounting will You have with us? Restore to us our lost possession 110 110 “Aveidah,” from Baba Metsia ch. 2: a lost possession, whose owner maintains ownership by not “despairing” of it. See LM 188: A person’s lost (spiritual) possessions are with the Tsaddik; one must (physically) go to him and claim them. Brayter has turned this idea on its head: the grave of the Tsaddik—perhaps the Tsaddik himself—are the “lost possession.” and we will serve You! This passage is a transcribed “outpouring of the soul,” 111 111 Based on Samuel I 1:15, becoming the name of B’zshilianski’s Hishtapchut haNefesh, a compilation of sources on hisobydedes. a stormy stream of thought and feeling in dialogue with the Divine; argument and supplication. Brayter writes/prays furiously, cutting sharply and without warning (and without punctuation) 112 112 In the translation here, I have added punctuation as I saw fit, to make it more readable. from one argument to another, alternating rapidly between diverse rhetorical elements. 113 113 In addition to the challenges, accusations, and demands, this passage contains elements of purely rhetorical function—such as arguments made on God’s behalf, and statements opening with “You know that…” There are several rhetorical questions, that, in the same breath as the accusatory statements, bear an intimate and almost childish quality (“words of charm,” in the Braslev lexicon—see LM II 25): “What will it hurt You? Does it not bring You the greatest pleasure?” So too, Brayter forwards a theological claim—also of rhetorical function—regarding hisboydedes: God desires that people pray, even though God knows all. Importantly, Brayter alternates between admissions of powerlessness and assertions of strength and stridency (“What is one to do! We won’t give you silence!”). He voices muteness and weakness in prayer (“How… to cry out;” “we are blind and mute;” “we have no idea what to speak”), and in the same breath asserts power in prayer (“We will roar”). The simultaneous assertion of weakness and power makes for a volatile combination, producing a subjective convulsion in self and other (in this case, the reader and the Divine interlocutor). 114 114 Similarly: “Spiritual resistance treads a narrow bridge between violent reactivity and passive submission…” Burger, Hasidic Nonviolence, 3. In a very different context, Martin Luther King manifested a religiously and politically potent fusion of polarities—including resistance and release; see Charles Hampden-Turner, Maps of the Mind (New York: Macmillan Publishing Company, 1981), 204-207. The Talmud attributed “hardness” and “softness” to David—Mo’ed Katan 16b. This Braslev prayer technique 115 115 See e.g. R. Noson Shternhartz, Likutei Halachot (Shomron: Mechon HaBashan, 2014), T’filin §5:43, on the “poor man’s” vehement prayer. One present-day Braslev teacher instructed alternating between forceful request and surrender. reflects a keen intuition in the dynamics of human emotion, and their presumed divine reflection. Through it, Brayter seeks, as Reb Nakhmen taught, 116 116 Such “defeat” is a source of pleasure to God. Sichot §69, based on P’sachim 119. to “defeat” God with his words: to seduce God, as it were, to religious intimacy—and acquiescence. This disjointed, nonlinear sequence of disparate expressions has a wild, chaotic, stream-of-consciousness quality to it. The elements come together to produce an emotive and dramatic impression as well as an emergent sense of a specifically arational 117 117 The arational and the transcending of mind are the major thrust of Mark’s reading of RN: Zvi Mark, Mysticism and Madness: The Religious Thought of Rabbi Nachman of Bratslav (London: Continuum, 2009). barrage. Amidst the outpouring, Brayter also inserted a clear and strongly worded request, phrased in the imperative, for God’s direct intervention in the political reality: “[S]hatter the borders and partitions… [of] all the regimes that prevent coming to the grave of this holy Tsaddik… and secure a path, that redeemed ones may pass…” This is Brayter’s most directly “political” expression, enjoining God to act directly upon history’s stage. Brayter’s impassioned outpouring is deeply important from a literary standpoint—starting with the choice of language. Yiddish enjoyed de facto pride of place in the oral culture of Hasidism generally. In Braslev (prominently, though not exclusively), Yiddish phrases were to be found also in many texts. Braslev writings, especially letters, sometimes dipped into the vernacular at moments of emotional urgency, when the heart had to be “awoken.” 118 118 See e.g. B’zshilianski, Hishtapchut haNefesh, §69, with an extended quote from Alim liTrufah, letter 235, quoted “in loshn taytsh [Yiddish]… [in order] that these words enter the heart…” In addition, Reb Noson, in his meticulous documentation of Reb Nakhmen’s life and words, took pains to preserve many of the Rebbe’s statements in the original Yiddish; arguably, to preserve their orality. 119 119 This was carried on in later literature: see Bender, Siach Sarfei Kodesh—where pain is taken to preserve the Yiddish original, and even emphasize it with bold letters. Yet, Braslev prayer texts were almost exclusively in Hebrew. 120 120 For the constituents of this genre, see Meir, “Liqqutei Tefilot,” 94. Brayter’s shift here to Yiddish marks, and enables, a literary innovation: he models the practice of hisboydedes in writing. In essence, Brayter “transcribes” the spoken, “living” hisboydedes—capturing on paper the spontaneous Yiddish prayer in its flight. 121 121 This is not the only such example in Brayter’s writings. See his letter to Korman, in She’erit, 138-9; and his “Tfilah Nora’ah,” ibid., 172-176. In the vernacular, Brayter “performs” textually what Reb Nakhmen instructed (in the same breath as the directive to practice hisboydedes in Yiddish): “to speak to God with arguments, justifications [amtala’ot], with words of charm and placation, to implore and beseech God to draw one close to His service truly.” 122 122LM II 25. Compare R. Noson Shternhartz, Shivchei HaRan (Warsaw: A. L. Cygielman, 1922), §11. With his prayer, I argue, Brayter proffered a powerful innovation in the genre—or, one could say, created a new genre altogether: the written hisboydedes. Twin title pages, the Apta edition of Likutei Moharan, redacted by Brayter and Lasker, from the collection of the National Library of Israel, Jerusalem. Their names, and the names of their fathers, appear above the thick block letters of “Apta” (=Opatów, in Polish), the place of printing. The gematria corresponding to the year of printing - 1938 - is formed from the Hebrew words: “Know, my children, for there is no despair in the world.” In smaller letters below this, in Yiddish: “Givald, children, never despair!” (Both are quotes of Reb Nakhmen, with the addition of the words “children.”) On the left column: “Hisboydedus is a lofty level, and greater than all” (LM II 25). On the right column: “It is a great mitzvah to be joyous always” (LM II 24). The page is stamped with the stamps of a Jewish bookseller on famous Nalewki street, the heart of pre-war Jewish Warsaw; and that of The National Library of Israel, where the books currently resides. This is the first edition of LM to have been printed in “block,” as opposed to Rashi script. With the grave site taken away, hisboydedes represents the remaining hope for undoing the decree—and for future life. Echoing the exilic shift from Temple 125 125 “Tsiyun” being related to “Tsiyon,” Zion. to synagogue (“mikdash me’at,” 126 126 From Ezekiel 11:16, and interpreted by one sage to mean synagogues and houses of study (Megillah 29a). a minor, or substitute, Temple), from sacrifices to prayer, Brayter casts the practice of spontaneous prayer as the provisional substitute for the holy place in Uman. Indeed, in the absence of the holy place, this practice, described as a gateway and path of ascent to God, takes on pseudo-geographic properties. …Hear verily our voice [shamo’a tishma’ kolenu] 128 128 Inflection of Exodus 16:26; Deuteronomy 11:13; 28:1, etc. Brayter audaciously inverts the call to listen. - which is none other than the voice that is pleasing to You, and already familiar to You—the voice of Your son, our Master Nakhmen ben Feyge, who cried out to You always over the suffering of Israel and Kudsha Brich-Hu uSh’chinteih [The Blessed Holy One and His Presence]. 129 129 These are respectively the masculine and feminine aspects of the Divine—whose full unification will be achieved in the redemption. For his sake do this and not for ours, see how we stand before You impoverished and empty… 130 130 These last phrases are quoted from the High Holiday liturgy. Before, in the ‘Sinaitic’ revelation that “there is no despair at all,” the voice of God spoke forth in its earth-shattering glory from Reb Nakhmen’s throat. Now, Brayter writes, the Hasidim, praying for the sake of God and Israel, bear the voice of the Rebbe, “already known to You.” It is a different quality of voice. 131 131 Significantly, in the earlier passage, Brayter referred to RN, the triumphant refuter of despair, using his father’s name, Simcha. Here, he refers to him by way of his mother’s name, Feyge. Reb Nakhmen related that, while living at the home of his father-in-law in his youth, he would go up to the attic, hide himself amongst the bundles of straw, and scream to God in a whisper. 132 132Shivchei HaRan, §11. It is that parched voice, 133 133 See the covertly autobiographical comment in CM, §545, and the overtly, ibid, §257. crying out for life, 134 134 See Sichot §117. that the “empty and impoverished” Hasidim now sound. In essence, hisboydedes is none other than Reb Nakhmen. 135 135 Similarly, Reb Noson said: “One who wants to taste the light of our Master, which is the Hidden Light, should practice much hisboydedus.” R. Avraham Chazan, Bi’ur haLikutim (Jerusalem: N. Burshteyn, 1973), §15. Behold… ‘out of my anguish and distress, I have spoken thus far,’ ‘for I am of embittered spirit’ 136 136 Samuel I 1:16, and cf. 15, respectively—the words of Hannah. From her prayer, the Sages learned laws of prayer; and from it, Samuel, who anointed David, was born. … Therefore, before I finish speaking before You, I will cry bitterly and speak out to You our very marrow; 137 137 In the original: עצמותינו—which may mean both “bones,” and “essence,” according to vowelization. In a number of places, RN spoke of praying with the bones—e.g. LM 50. for all our hopes are dashed, and every time we seek to strengthen ourselves to go in Your ways, we fall deeper and deeper… and there is no hope—until You shall deliver us, and restore to us our Torah, our prayer, our lights, our joy… our hopes, our encouragement, 138 138Hitchazkuteinu. our renewal, 139 139Hitchadshuteinu. our standing before You in prayer. Open for us a way through the sea and a path through storm-tossed waters, 140 140 Based on Isaiah 43:16. See LM 6:7, “Shayach le’eil,” and ibid. II 87. and bring us speedily to the place where Your Sh’china remains, the unique place on earth where You have desired to dwell[!] 141 141 The Sages taught that the Sh’china never departs from the western wall of the Temple. Arguably, as the unqualified “unique place on earth,” Uman essentially displaces Jerusalem. However, beyond this text, Brayter did not do away with the Land of Israel’s special status: in fact, the Land was for him a source of yearnings no less impassioned than Uman. See “Seder HaYom” §27, in which “yearning, and praying, and endeavoring” “all the days of one’s life” to come to the Land and settle in it conclude his program of devotions. Among his (unpublished) letters, the majority deal with his prodigious, and tragically unsuccessful, efforts to do so (R11-BC-Box 1, Schocken). It is fair to say that Brayter’s life was dominated in large part by the yearnings for the Holy Place. That spiritual reality in fact had two physical loci. 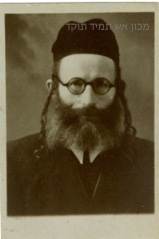 In the shorter Uman prayer from 1934, Brayter wrote, in conventional Braslev style: “the Tsiyun, sanctified with the sanctity of Erets Yisrael…” It is appropriate, on that note, to bring Green’s comment: “…[W]e are not claiming… that Jewish mysticism or Hasidism abandoned its awareness of or commitment to Jerusalem as the center of the universe. As [Mircea] Eliade has amply shown us, the peculiar logic of homo religiosus has no difficulty in absorbing the notion that the cosmos may have more than one center.” Green, “Zaddiq,” 330. For a diametrical understanding of Uman, see Mark, “Tsaddik haNatun.” … And even if ‘the Lord has deserted His altar, rejected His Temple,’ 142 142 Lamentations 2:7. [still] He has preserved for us a shvila dakik—a narrow path—of hisboydedes; and God 143 143 From here through the end of the prayer, Brayter speaks of God in the third person. While such a shift is not atypical in Jewish prayer, and in Likutei Tefilot specifically, it is noteworthy here at the very end of the prayer. Perhaps, Brayter turns here to his community. is close to us very much through this path, and through it we will be certain and hopeful that He will shine His compassion upon us, and bring us speedily and with compassion to the holy Tsiyun for this coming Rosh Hashanah, amen and amen. The prayer for restoration of the holy place thus concludes as a prayer for prayer. Brayter’s prayer traces an arc: from the lofty words of High Holiday liturgy, through the tense history of holiness and concealment, locked in conflict, rising to a climax of messianic tension and anticipation; the rupture of history in the unbearable present, and the fiery words, in unequivocal mother-tongue, of an anguished, “blood-filled heart;” invocation of the power of prayer; and concluding with notes of a muted, anxious hope. Brayter’s prayer is a valuable historical text, offering as it does a window into the historical experience of a Hasidic community in a time of flowering and crisis, in “real time,” so to speak. Brayter sketches his community’s self-awareness as he narrates the divine story of history’s meanders, its oscillations of dark and light. From a highly particularistic Braslev vantage point, the prayer seeks to bridge between an expansive, redemptive vision of “inner” (spiritual) history, and the political realities of Brayter’s contemporary present. And yet, for all its Braslever particularity, it reflects much of the interwar Polish Jewish reality in which it was written. The sense that history was crumbling—and that painful current events were birth-pangs of a redemption—was shared by many Polish Jews in the interwar years. Brayter’s historiosophy may exemplify the historical, and messianic, consciousness on the rise amidst interwar Polish Jewry. 144 144 On the historical, see Eliezer Schweid, “HaShiva el haHistoriah baHagut haYehudit shel haMe’ah haEsrim,” in Chevrah veHistoriah, ed. Yechezkel Kohen (Jerusalem: Misrad haChinuch, 1980). On the messianic, and its secular iterations, see e.g. Michael C. Steinlauf, “Hope and Fear: Y.L. Peretz and the Dialectics of Diaspora Nationalism, 1905–12,” in Warsaw. The Jewish Metropolis, 239. Written, so to speak, from history and to history, Brayter’s prayer is also an important text as literature. Brayter narrates a great drama in which Reb Nakhmen, the iconoclastic Tsaddik, is cast as history’s redeemer. Declaring, “There is no despair at all,” Reb Nakhmen bears the voice of God. The narrator celebrates an unforeseen flowering of Braslev Hasidism on history’s stage, his narration swelling with anticipation. And yet, the outgrowths of war and revolution in Brayter’s historical present bring the trajectory of redemption to an abrupt halt. In the text, as in reality, the hero becomes profoundly concealed. Indeed, Reb Nakhmen’s final appearance in this drama is in disappearance—only his “already familiar voice” can be heard, crying out, pleading. Surrendering to the tension, Brayter relinquishes narration—and Hebrew—and accedes to the words of the unmediated heart. Brayter confronts God directly, in Yiddish, seeking with every argument he can muster to conquer God’s heart. Powerfully, Brayter lets his readers listen in on his “seclusion,” sharing his passionate protest. (As is the nature of text, readers at a later date—for us, almost a century later—are made privy to a moment.) Shedding the classic textual language, as well as the linearity of thought and presentation that defined conventional writing—Brayter pushes textuality to its limits. His written words aspire, for a moment, to escape textuality altogether, to achieve orality, just as they seek to breach the curtain of iron that God has cast. Medium thus embodies message. The flight of the pen mirrors and models the aspiration to breach the partition, and reach God’s face. Brayter’s prayer models rhetoric in the service of the heart. So too, it enacts faith in the power of dialogue with the Divine to rend the veil of history, and humanize the inhuman. Language that is alive, Brayter argues, can cross chasms. His prayer offers, in his words, a narrow path, a fracture through which a thread of light may enter, bringing deliverance. 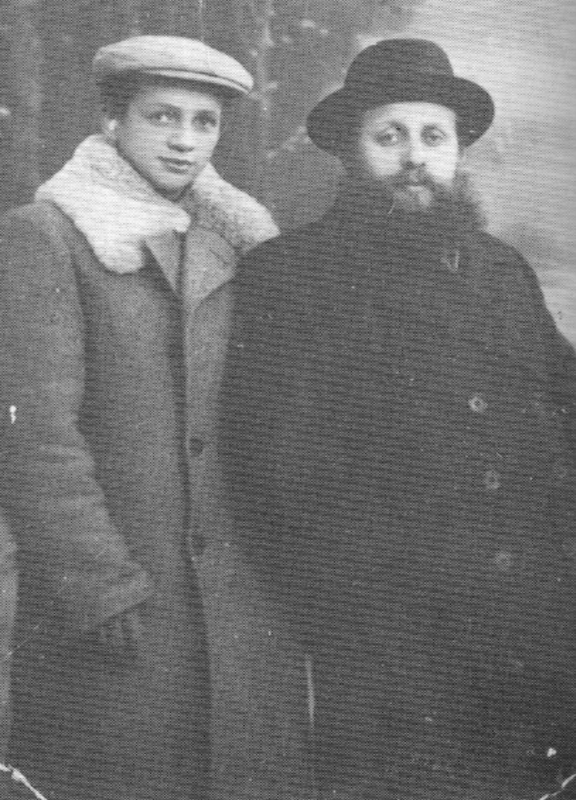 Tsvi Lasker and his son Mordechai. Both survived the war. The photo belongs to Mordechai’s daughter. My thanks to the Veinshtok family. The trove of letters known as the Korman Collection, discovered in 2016 at the Schocken Institute of Jerusalem, has contributed immeasurably to the study of the Polish Braslev movement. The letters, brimming with hitherto-unknown facts, names, and exchanges, has yielded a vastly richer picture of the life, and death, of Polish Braslev. The uncensored record of the Hasidim’s communal projects and private lives, devotions and relations, internal schisms, and (mostly unsuccessful) efforts to emigrate to the Land of Israel (and even found a Braslev settlement in the Galilee), is rich with historical and intellectual insights, and surprises. One particularly remarkable set of letters comes from one Reb Tsvi Lasker. Lasker was a student, friend, and collaborator of Reb Yitskhok Brayter. From his letters emerges a historical fact that is deeply significant in light of Brayter’s prayer: Brayter sojourned to Uman for Rosh Hashanah of 1937. 145 145 It is likely that this pilgrimage was made with the permit granted by the Soviet government that same year. See article in Undzer Ekspres, cited above. Remarkably, Lasker wrote letters to Korman, then already in Palestine, from Vilna in 1940, 146 146 The city passed between Lithuanian and Soviet hands a number of times from 1939-1941, until the Germans occupied the city in June 1941. and again, from Bergen-Belsen, in 1947. In both years, he beseeched Korman to procure for him a “sertifikat,” (permit of entry to British-Mandatory Palestine). His first letter from 1940 was attached to a letter from Reb Aharon Leyb Tsigelman, a leading Braslever caught with his family in occupied Warsaw. Tsigelman too sought Korman’s aid in obtaining a permit for himself and his family, yet, Lasker writes, “They [in Warsaw] do not have permission to write about this, but I, who escaped with my life in my hands, am able to inform you of this.” 147 147 Letters of R. Tsvi Lasker, Bratslav KC, Schocken Institute, letter 1, p. 90. After discussing Tsigelman’s request, midway in his letter, Lasker writes: “If you wish to know who writes to you these words, I hereby remind you, my name is Tsvi the son of Freydl Lasker, who traveled in 1937 to Uman with Reb Yitskhok Brayter.” 148 148 Ibid. I am grateful to R. Shmuel Tefilinski for directing me to this source. Also in his letter to another Braslev elder in Palestine, in this same collection, Lasker introduces himself as one who went with Brayter to Uman. With this one sentence, Lasker’s letter, extraordinary in its own right, serves as a literal postscript to Brayter’s prayer, and sets the story of Brayter’s prayer, and life, in a new light. Lasker writes later in that letter: “And if you will manage also to attain a sertifikat [entry permit] for me, then I believe, you will merit life in the world to come and the days of the Messiah… My heart and my flesh pine for the land of the living God!” 149 149 Ibid. There was a Kibbutz—but woe to that Kibbutz, that prays under a flood of bombs, bullets, fires and gruesome deaths… Let me attempt to describe to you on cold paper—which can bear anything—a most brief summary of the Kibbutz… As you know, the evil one was sent by Providence to destroy the world on the first of the ninth gentile month, this being two weeks before Rosh Hashana 5700. And from the first to the tenth of the month, “he” rained iron, sulfur and fire upon Warsaw, and killed indiscriminately, men, women and children. But for three days, the cruel enemy tired and stopped [the barrage], until the days 150 150 “Erev Rosh Hashanah.” Below, Lasker writes that there was a three day pause in the bombings. It follows that Erev Rosh Hashanah refers to several days leading up to the New Year. before Rosh Hashanah. And we, “our folk,” gathered, trembling and shaking, to pray in our shtibl at Nowolipie [Street, number] 28, at four p.m. until 7, because later it was forbidden to leave the homes. We thought that the enemy had forgotten Warsaw and would give us rest, at least for two more days [the days of Rosh Hashanah], because for the previous three days he had refrained from destruction. Understandably, not many of us were audacious enough to go out and gather in our shtibl, but several came, a little more than a minyan. But behold, the enemy evidently sensed that such a minyan was preparing to gather and prepare to pour forth its words before its Maker, with the participation [hishtatfut] of the holy soul of our tsaddik, our master, Nakhmen son of Feyge of blessed memory. And just as we left our homes, “he” [the Germans] began [to bombard]! Yet it was not possible to return [home] and we had to pass under a deluge of bullets [on the way] to our shtibl. Approximately a minyan of “our folk,” beset with hunger, weak, and fearing for our lives, gathered and arrived with our last strength to the doorstep of the true Tsadddik, Nowolipie 28. If one looked to his fellow, the lips of the heart would clot… Bullets, bombs, fires, and skies blackened with birds of prey, “birds” of iron, and in their mouths the same poison which our holy Master saw in a dream 140 years ago 151 151 See CM §82. … Yet we bound ourselves to the true Tsaddik, and consigned our souls to the hands of God. Reb Aharon Aryeh [Aharon-Leyb Tsigelman] led Maariv [evening prayers] before nightfall, with God’s help, but the enemy darkened for us the day and lit up the sky with fiery bombs, and burned and scorched the Jewish quarter. Two thousands Jews were consumed in two hours!!! [Meanwhile, w]e concluded the prayer hurriedly, in about a half-hour, and with the fear of death [upon us,] we set out to return to our respective homes. On all four sides we were surrounded by tongues of hellish fire. We quite simply had to pass through fire to return home. 152 152 Lasker, letter 2, p. 91-92. This is the very short account of the Kibbutz of the eve of this year’s Rosh Hashanah. But I cannot convey all of it at once, patience and compassion do not allow me to write it all in one sitting. That for now is enough of our suffering [to put] in writing. And may the One who said “enough” to His world, 153 153 Yalkut Shimoni 8, 1, and other Midrashic sources. say “enough” to our suffering. 154 154 A common expression in later Rabbinic sources. With regards to the petition for me to come to the Holy Land, I must preface that I have no words to express the extent of my longing, my yearnings and pinings, and the pounding of my heart, to hear that you, my beloved brother, a student of the true Tsaddik, will do everything to bring me to His city Zion and Jerusalem the city of His temple. All my days I yearned greatly to go up to the land, all my life I have yearned to kiss the dust of the land. I remember the nigun with which the Melamed intoned the verses, “And I, as I came from Padam-Aram, my wife Rachel died upon me;” 155 155 Genesis 48:7. “Rachel weeps over her children, refuses to be consoled…” 156 156 Jeremiah 31:14. To that Mother Rachel who weeps for her children, to her and her grave, I desire [to come], to weep with her over our children and our people… I have no other place except in the land of the Fathers. Therefore, what [more] can I say. Do everything possible, wake up, awaken, seek the face of the One who dwells Above, that I may enter His holy land… With the help of the One who dwells in Zion I will manage also to retrieve them [Lasker’s wife and children] from siege and imprisonment [occupied Warsaw]. For my purpose in wandering in foreign lands was only to arrive at that holy endgoal: the shores of the land of Tsvi. 157 157 beauty, a reference to the land of Israel. Daniel 11:16, and 41. Photo of Reb Yitschok Meir Korman. Credit to R. G. N. and the “Esh Tamid Tukad” Foundation for the memory of Braslever Hasidim in Poland. I am including my photograph, perhaps you will have greater compassion if you will see the face and the eyes—the same eyes that pierced the eyes of Reb Yitskhekl of Otvotsk, the eyes of Yitskhok Brayter, the eyes of Reb Aharon Aryeh [Tsigelman], and their eyes looked into the eyes of Reb Shimshon [Barski of Uman], going back to the eyes of the Rebbe… 158 158 A Braslev oral tradition relates: joy to the eyes that looked into the eyes of the Rebbe (=Reb Nachman). And joy to the eyes that looked into the eyes that looked into the Rebbe’s eyes. And so forth. See Bender, Siach Sarfei Kodesh, v. 2, 531. I raise my eyes to the heavens, and beseech the One who dwells in heaven, to allow me soon to see the blue, pure skies of the land of Israel… Forgive me, my beloved brother, for my many words. These are not empty words, rather the cries of a Jewish heart, hurting and grieving over the impoverishment of the Jewish people…. 159 159 Letters of Lasker, 93. Lasker concludes with a postscript: “I request very much to send the holy book Likutei Moharan, and perhaps even the new edition which I edited, 160 160 Brayter and Lasker together edited the “Apta” edition of Likutei Moharan (Apta: 1938), in consultation with manuscripts. (That edition was reprinted after the war in Regensberg, 1947. See photo.) because they stole everything from me, also my talis and tfilin they stole from me. The above-signed.” 161 161 Ibid. See Sefer She’erit Yitschak: VeHu Sipur Chayav… veKovets Ma’amarav… shel… Reb Yitschak Brayter (Jerusalem: Agudat Meshech haNachal, 2009), 203-221. According to the Braslev tradition, he was identified by the Nazis as a Jüdenführer (“Jewish leader”) and was among the first sent to Treblinka; see She’erit, 24). Based on Samuel I 1:15, becoming the name of B’zshilianski’s Hishtapchut haNefesh, a compilation of sources on hisobydedes. Brayter’s word, translated as “smolder”, is tlien—the same as in RN’s promise, “my fire will yet smolder until Mashiach’s coming” (Ibid, §46. See Mark, ibid., 72). Brayter references that statements, exhorting God to act before the remaining light decays and dies. Echoing RN: “Though you are decent people, yet this was not my intention. I intended for you to be people who roar to God entire nights like wild animals in the forest.”” (R. Levi-Yitschak Bender, Siach Sarfei Kodesh, ed. R. Avraham Vaytzhandler (Jerusalem: Agudat Meshech haNachal, 1997), vol. 2, §120, 31; quoted by Mark, Scroll of Secrets, 70, fn 14—see messianic context there. Compare CM, §225). Evening prayer, based on Berachot 11b. In the translation here, I have added punctuation as I saw fit, to make it more readable. Brayter uses the informal du (“thou”), as is the Yiddish norm when addressing God, creating an intimacy that the English “you”—and especially the capitalized “You” used here—fail to convey. In addition to the challenges, accusations, and demands, this passage contains elements of purely rhetorical function—such as arguments made on God’s behalf, and statements opening with “You know that…” There are several rhetorical questions, that, in the same breath as the accusatory statements, bear an intimate and almost childish quality (“words of charm,” in the Braslev lexicon—see LM II 25): “What will it hurt You? Does it not bring You the greatest pleasure?” So too, Brayter forwards a theological claim—also of rhetorical function—regarding hisboydedes: God desires that people pray, even though God knows all. Similarly: “Spiritual resistance treads a narrow bridge between violent reactivity and passive submission…” Burger, Hasidic Nonviolence, 3. In a very different context, Martin Luther King manifested a religiously and politically potent fusion of polarities—including resistance and release; see Charles Hampden-Turner, Maps of the Mind (New York: Macmillan Publishing Company, 1981), 204-207. The Talmud attributed “hardness” and “softness” to David—Mo’ed Katan 16b. See e.g. R. Noson Shternhartz, Likutei Halachot (Shomron: Mechon HaBashan, 2014), T’filin §5:43, on the “poor man’s” vehement prayer. One present-day Braslev teacher instructed alternating between forceful request and surrender. Such “defeat” is a source of pleasure to God. Sichot §69, based on P’sachim 119. The arational and the transcending of mind are the major thrust of Mark’s reading of RN: Zvi Mark, Mysticism and Madness: The Religious Thought of Rabbi Nachman of Bratslav (London: Continuum, 2009). This was carried on in later literature: see Bender, Siach Sarfei Kodesh—where pain is taken to preserve the Yiddish original, and even emphasize it with bold letters. Based on Isaiah 62:7, demanding the restoration of Jerusalem. Compare Yiddish poet Itzik Manger’ failure to complete a work that addresses the Shoah: David Roskies, “The Master of Prayer: Rabbi Nahman of Bratzlav,” in God’s Voice in the Void, 67. This is not the only such example in Brayter’s writings. See his letter to Korman, in She'erit, 138-9; and his “Tfilah Nora’ah,” ibid., 172-176. Lamentations 2:16—Brayter appropriates these words, spoken by the devourers of Jerusalem. YeNaKhaMenu—sharing the same root as NaKhMen. In at least three other places, Brayter wrote of the Polish awakening in similarly superlative, and messianically-charged, terms: Dover Shalom (Warsaw: Warsaw: A. L. Cygielman, 1934); “Michtav Hitorerut," in R. Shimshon Barski, Etsot Mevu’arot (Jerusalem: Agudat Meshech haNachal, 1992), 10-11; and a letter from 1926, She'erit, 145. Jeremiah 9:20—read on Tisha beAv. Ibid. 4:20. For other messianic usages of this verse, see Smadar Cherlow, Tsaddik Yesod Olam: HaShlichut haSodit vehaChavayah haMistit shel haRav Kook (Ramat Gan: Hotsa’at Universitat Bar Ilan, 2012), 360, fn. 36. See CM §197, and Sichot §156. Resonating with ‘Tsiyun’—i.e. RN’s gravesite. Until this point, the prayer was in Hebrew. This sentence is a brief interjection of Yiddish, followed by a few more sentences of Hebrew. After it will come a long passage in Yiddish. See below. “Beino”—may refer to the Tsaddik, or to the grave—and also to God. See Marcin Wodziński, “War and Religion; or, How the First World War Changed Hasidism,” Jewish Quarterly Review 106, no. 3 (Summer 2016), 283-287. LT I, prayers 4, 17, and 63. See Meir, "Liqqutei Tefilot,” 71. For the constituents of this genre, see Meir, “Liqqutei Tefilot,” 94. LM II 25. Compare R. Noson Shternhartz, Shivchei HaRan (Warsaw: A. L. Cygielman, 1922), §11. Given the general obscurity of Braslev in Poland before the interbellum “awakening,” this seems to refer to the opposition’s prevention of R. Nakhmen from becoming known there. Lasker, letter 2, p. 91-92. It is likely that this pilgrimage was made with the permit granted by the Soviet government that same year. See article in Undzer Ekspres, cited above. The city passed between Lithuanian and Soviet hands a number of times from 1939-1941, until the Germans occupied the city in June 1941.
Letters of R. Tsvi Lasker, Bratslav KC, Schocken Institute, letter 1, p. 90. Ibid. I am grateful to R. Shmuel Tefilinski for directing me to this source. Also in his letter to another Braslev elder in Palestine, in this same collection, Lasker introduces himself as one who went with Brayter to Uman. 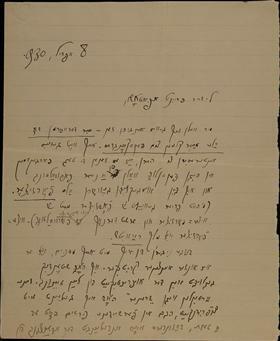 “Erev Rosh Hashanah.” Below, Lasker writes that there was a three day pause in the bombings. It follows that Erev Rosh Hashanah refers to several days leading up to the New Year. Yalkut Shimoni 8, 1, and other Midrashic sources. From here through the end of the prayer, Brayter speaks of God in the third person. While such a shift is not atypical in Jewish prayer, and in Likutei Tefilot specifically, it is noteworthy here at the very end of the prayer. Perhaps, Brayter turns here to his community. A common expression in later Rabbinic sources. beauty, a reference to the land of Israel. Daniel 11:16, and 41. A Braslev oral tradition relates: joy to the eyes that looked into the eyes of the Rebbe (=Reb Nachman). And joy to the eyes that looked into the eyes that looked into the Rebbe’s eyes. And so forth. See Bender, Siach Sarfei Kodesh, v. 2, 531. On the historical, see Eliezer Schweid, “HaShiva el haHistoriah baHagut haYehudit shel haMe’ah haEsrim," in Chevrah veHistoriah, ed. Yechezkel Kohen (Jerusalem: Misrad haChinuch, 1980). On the messianic, and its secular iterations, see e.g. Michael C. Steinlauf, “Hope and Fear: Y.L. Peretz and the Dialectics of Diaspora Nationalism, 1905–12," in Warsaw. The Jewish Metropolis, 239. The phrase, “hinted to us from afar and from near,” appears in R. Noson’s introduction to Likutei Moharan. Significantly, in the earlier passage, Brayter referred to RN, the triumphant refuter of despair, using his father’s name, Simcha. Here, he refers to him by way of his mother's name, Feyge. “Tsiyun” being related to “Tsiyon,” Zion. From Ezekiel 11:16, and interpreted by one sage to mean synagogues and houses of study (Megillah 29a). Elsewhere, Brayter wrote the reverse—that the Rebbe is God’s guarantor: “For through this [practice], all will be set right… and I [Reb Nakhmen—so Brayter writes in his name] am guarantor of it” [added emphasis]—from “Awakening to Hisboydedus,” in Hebrew and Yiddish—reprinted in She'erit, 103-4 and 170-1, respectively. About the all-rectifying power of hisboydedus, see also his “Seder haYom” §12, cf. 93; “Song of Affection,” cf. 199, and in Meir, “Shir Yedidot,” 247. Inflection of Exodus 16:26; Deuteronomy 11:13; 28:1, etc. Brayter audaciously inverts the call to listen. These are respectively the masculine and feminine aspects of the Divine—whose full unification will be achieved in the redemption. These last phrases are quoted from the High Holiday liturgy. See the covertly autobiographical comment in CM, §545, and the overtly, ibid, §257. Similarly, Reb Noson said: “One who wants to taste the light of our Master, which is the Hidden Light, should practice much hisboydedus.” R. Avraham Chazan, Bi’ur haLikutim (Jerusalem: N. Burshteyn, 1973), §15. Samuel I 1:16, and cf. 15, respectively—the words of Hannah. From her prayer, the Sages learned laws of prayer; and from it, Samuel, who anointed David, was born. In the original: עצמותינו—which may mean both “bones,” and “essence,” according to vowelization. In a number of places, RN spoke of praying with the bones—e.g. LM 50. Based on Isaiah 43:16. See LM 6:7, “Shayach le’eil,” and ibid. II 87. This place name has multiple transcriptions and spellings. In most English academic works, it appears as “Bratslav” or “Bratzlav,” the Ukrainian name. Local Jews called it “Broslev,” while the Polish Hasidim called it “Braslev.” Given the provenance of the text at the heart of this essay, I have opted here for this latter pronunciation. As we will see, Brayter’s prayer is largely structured as a narration of history, addressed to God. This echoes the novellae, addressed to God, in the Yad haK’tanah, which R. Nakhmen suggested as a literary model. See R. Noson Shternhartz, Sichot haRan (Warsaw: A. L. Cygielman, 1922), §145. The Braslev literature speaks of garbing (and in some contexts, cloaking) Tefilah (prayer) in Torah, and vice versa: see LM 5; Sichot, ibid; R. Noson Shternhartz, Likutei Tefilot (Warsaw: A. L. Cygielman, 1930), Introduction. See also CM, §387. These two modalities represent a two-way street of transmuting, while transmitting, meaning and content—wherein the writer communicates on overt and covert planes, with God as well as the reader. See e.g. 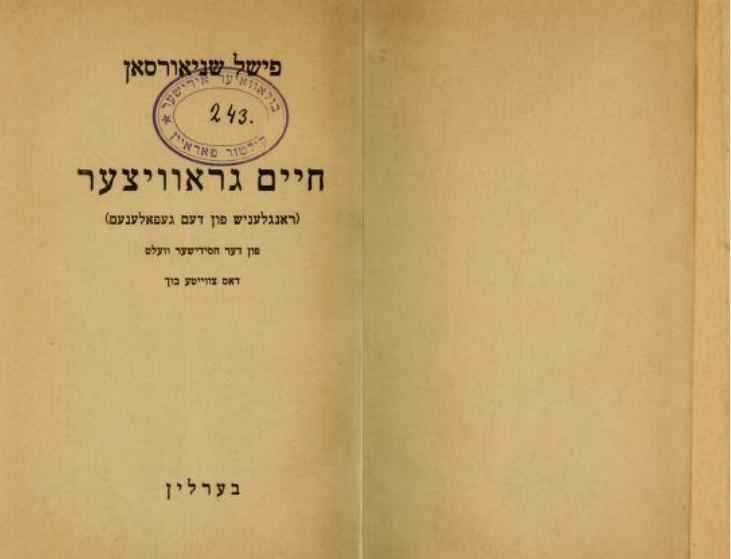 the end of the introductory “words of awakening” (possibly penned by Brayter), following the title page to the Warsaw edition of R. Moshe Yehoshua B’zshilianski (known as R. Alter Tepliker), Hishtapchut haNefesh (Warsaw: Prompol, 1919). See the article from Undzer Ekspres, Aug. 26, 1937, above. See e.g. his letter to a young Hasid—She'erit, 141-2. On spiritual resistance, see Burger, Hasidic Nonviolence, 2-6. See that dissertation for different forms of such resistance on the part of Reb Noson of Braslev. Prayer “to merit to… prostrate on the holy grave of our Master… in Uman,” in Tikun HaKlali [with commentary] (Warsaw: Bei Knishta Chada, 1934), 85-91; reprinted in She'erit, 166-169. A central theme in this shorter prayer is the rectification of the sexual, reflecting modern, interwar social realities. Beyond its careful textual construction, this is evidenced e.g. by the lacuna for the dedication of an unnamed sum for charity, near the beginning of the text. See below. Its only paratext is the title, which may or may not be the author’s. See R. Noson-Zvi Koenig, ed., Nachalei Emunah (Tel Aviv: Arava, 1967), 82-91, and reprinted in She’erit, 156-165. A type-written copy of the prayer exists in the recently uncovered “Korman Collection” at the Schocken Institute, Jerusalem (Bratslav KC 4.1). Korman worked at the Institute after the war, and had hundreds of manuscripts—primarily letters from his correspondences with Polish Braslevers, and also texts like this prayer—transcribed. These transcriptions were deposited at the Institute and forgotten, until surfacing in 2016—while the originals (or many of them) were sold to Koenig, who published a relatively small portion of them, with some censorship. The existence of the remaining, unpublished letters was never disclosed. Including introductory and concluding verses of the Amidah (Deuteronomy 32:3; Psalms 51:17, 19:15, the latter two appearing consecutively, as here, in the piyut “Ochila laEl,” from the High-Holidays Musaf prayer); a performative utterance of “hitkashrut”—“binding oneself” to the “true Tsaddikim, and [in particular] to the true Tsaddik, the ‘flowing stream, source of wisdom,’ our Master, Nakhmen son of Feyge” (on this ritual, see Meir, “Shir Yedidot”, 206, fn. 85); and a declaration of dedicating charity for the latter’s soul (dovetailing with RN’s instruction to do so, and recite the Tikun haKlali, at his gravesite). These statements are followed by a long sequence of passages from the High Holidays liturgy, which contextualize the prayer within the classical Jewish redemptive vision evoked in the “days of awe.” Following this is a sequence of 29 verses from Psalms, all of them containing the word “derech” (“path”, “way”), or a synonym thereof—a rhythmic repetition that anticipates the request that God open the way to Uman. By 1936, Tsigleman had printed 75,000 books. See the beginning of Dover Tsedek (Warsaw: A. L. Cygielman, 1933), for an extremely detailed account of what had been printed. From the confession in the Yom Kippur prayer. The motif of concealment and revelation, darkness and light, is dominant in this text. A crucial teaching for understanding the Braslev resonances of this motif is to be found in LM §115. Elsewhere, Brayter ascribes such preparations exclusively to RN—and these define him as the sui generis Tsaddik: Chalukei haNachal §7:20. See too “Song of Affection,” She’erit, 198, and Meir, “Shir Yedidot,” 248. Interestingly, Brayter does not mention Moshe or Rebbe Shimon bar Yochai, the first two of the five “true Tsaddikim” in the Braslev narrative. See CM, §279, quoted in Arthur Green, “The Zaddiq as Axis Mundi in Later Judaism,” Journal of the American Academy of Religion, v. 45, No. 3 (Sep., 1977), 336; and Brayter’s Chalukei Nachal §7:16. See too Mark, The Revealed and Hidden Writings, 252-3, fn. 107. See the final paragraph of LM II 78. The kabbalistic concept of a root-soul was intensively developed by RN, and appears frequently in Likutei Moharan. Brayter turned it into an article of faith in Chalukei Nachal §7. See also She’erit, 140. R. Yitschak Meir Korman, “Kruz al Rosh Hashana 5716”, §10, Bratslav Korman Collection, Schocken Institute. I am grateful to R. Shmuel Tefilinski for bringing this source to my attention. See e.g. Ayin Zocher (Warsaw: A. L. Cygielman, 1928), §17. On the obscurity of Braslev in Poland until the 20th century, see e.g. Moshe Krone, “Pesach im Chasidei Bratslav," HaTsofeh, 13 Nisan 5703 (1943). Uman is the site of the annual Rosh Hashanah (new year) pilgrimage, and the locus of mythic rectifications central to the Braslev imagination. R. Nakhmen chose to be buried in the old cemetery in Uman, where thousands of martyrs from a 1768 massacre lay. In the months before his death, he made a number of statements about the rectifications his burial site would effect—for the souls of the dead, and for the living. RN famously promised that whoever would come to his gravesite, give a coin to charity for his soul, and recite the ten chapters of Psalms (the Tikkun ha-Kelali)—“even if his sins are very great”—he would pull him out of deepest hell “by his peyes.” See R. Noson Shternhartz, ed., Hayey Moharan (Leshon Tsadik; place and date unlisted), §225; and Zvi Mark, The Revealed and Hidden Writings of Rabbi Nachman of Bratslav: His Worlds of Revelation and Rectification, trans. Yaacov David Shulman (Jerusalem: Magnes, 2015), ch. 4, esp. 177-190. For literature on the gravesite and surrounding rituals and beliefs, see list of sources in David Assaf, Braslev: Bibliographia Mu’eret (Jerusalem: Merkaz Zalman Shazar, 2000), 221-231, and Zvi Mark, “Tsaddik haNatun beLo’a haSitra-Achara: HaAdam haKadosh vehaMakom haTame,” Reshit 2 (2010, 112-146), 112, fn. 1; Arthur Green, Tormented Master: A Life of Rabbi Nahman of Bratslav (Tuscaloosa: University of Alabama Press, 1979), ch. 6, and Appendix; and Yakov Travis, “Adorning the Souls of the Dead”, in God's Voice from the Void: Old and New Studies in Bratslav Hasidism, ed. Shaul Magid (Albany, NY: SUNY Press, 2002), 155-192. On the Tikun haKlali, see below. Polish Braslev has not been sufficiently researched—see Assaf, Bibliographia, 13, and Jonatan Meir, “Shir Yedidot leRabi Yechiel Mendel mi-Medvedivka,” HaTfilah beYisrael: Hebetim Chadashim, ed. Uri Erlich (Be’er-Sheva: Universitat Ben Gurion, 2016), 203, fn 70. For existing research, see Mendel Piekarz, Chasidut Polin bein Shtei haMilchamot uviGzerot Tash-Tashah (‘HaShoah’) (Jerusalem: Mosad Bialik, 1990), 340-341; Asaf, ibid, ch. 13; and Meir, ibid, 191, 203-206. See Glenn Dynner and François Guesnet, ed., Warsaw. The Jewish Metropolis (Leiden: Brill, 2015), esp. introduction, and ch. 5. The realities of modern city life made need for innovative adaptations. See the comment of Heschel, who for a period of his adolescence joined the ranks of the Braslevers of Warsaw: Abraham Joshua Heschel, A Passion for Truth (New York: Farrar, Straus & Giroux, 1973), 215, fn. 2. There are quite a few remarkable accounts of these dances, in particular from external sources. See e.g. Krone, “Pesach;” Chemjo Vinaver, Anthology of Hassidic Music (Jerusalem: The Jewish Music Research Centre, 1985), 258, 261; journalist Binyamin Davidzohn, quoted in Rikudim beMishnat Braslev (Mishnat Braslev leUvda uleMaaseh, 2015-6), 67-68, fn. 12). Green brought historian Emmanuel Ringelblum’s harrowing account of dances in the ghetto, as a coda to his biography of RN—the only mention of Polish Braslev in that work: Tormented Master, 266. See too Ariel Burger, Hasidic Nonviolence: R. Noson of Bratslav’s Hermeneutics of Conflict Transformation (PhD diss., Boston University, 2008), 5. The most prominent, though uncommon, example was Hillel Zeitlin, a leading Varsovian Jewish cultural and political figure who became something of a “neo-Braslever.” See In geveb article about Zeitlin: Arthur Green and Ariel Evan Mayse, “‘“The Great Call of the Hour’: Hillel Zeitlin’s Yiddish Writings on Yavneh,” In geveb, March 8, 2016, https://ingeveb.org/articles/the-great-call-of-the-hour-hillel-zeitlins-yiddish-writings-on-yavneh; and Jonatan Meir, Yeriot v. 5: Rabbi Nahman of Bratslav: World Weariness and Longing for the Messiah—Two Essays by Hillel Zeitlin [Hebrew] (Jerusalem: Arna Hass, 2006). “Anash,” literally “people of our peace”, i.e. fellow members of one’s Hasidic group. See Krone. In anthropological parlance, the onlookers straddled the line between edic and emic. For the impact of these encounters on a leader of Po’alei Zion-Left, see She’erit, 217. An interesting parallel case of influence of Braslevers on secular activists is the appropriation of the name “Kibbutz” by Labor Zionists in Palestine, from Braslevers they met there—see Yehuda Erez, ed., Sefer haAliyah haShlishit (Tel Aviv: ‘Am ‘Oved, 1964), 889. Scott Ury wrote about the Warsaw coffee house as a place of social experimentation and identity-testing in a new urban reality of dislocation. Scott Ury, “In Kotik’s Corner: Urban Culture, Bourgeois Politics and the Struggle for Jewish Civility in Turn of the Century Eastern Europe,” in Warsaw. The Jewish Metropolis, 207-226. Moshe Rosman, “Categorically Jewish, Distinctly Polish: The Museum of the History of Polish Jews and the New Polish-Jewish Metahistory,” Studia Judaica 32, no. 2 (2013), 47–75. See CM, Godel Yikrat haRosh Hashana shelo. R. Nakhmen ben R. Simcha, Likutei Moharan (Warsaw: A. L. Cygielman, 1924), 66:4. Ibid., e.g. : “in particular when one wants to go to the True Tsaddik… upon which everything depends.” See also ibid., 195. For the obstacles Brayter overcame on the path to Uman, see Yagelnik, “Sipurim,” 210. This is unique to the Polish Braslevers. See e.g. “Umaner khsidim bekumen an’erloybnish,” Undzer Ekspres, August 26, 1937, 9 (accessible by search or browse at Historical Jewish Press, http://jpress.nli.org.il). See too a letter to the editor of that paper, from Hasidim including Brayter, identifying themselves as “Umaner khsidem,” May 13, 1936. This spelling out of the Tsaddik’s name is unique. Throughout Likutei Tefilot, RN is never mentioned explicitly, only alluded to through the veil of “the True Tsaddikim.” See Jonatan Meir, “R. Nathan Sternhartz’s Liqqutei tefilot and the Formation of Bratslav Hasidism,” Journal of Jewish Thought & Philosophy 24 (2016), 66-67. The “quintessence” that gives rise to the four classical elements. See LM II 67. A psychoanalyst wrote, “Accomplishing what language does not readily do, the arts subjectify the outer world and objectify the inner…” Gilbert J. Rose, Between Couch and Piano (East Sussex: Brunner-Routledge, 2004), 2. I would argue that hisboydedes—including its verbal dimension—is art also in this sense. RN's teachings often contain parallel paths, for those of high attainment, and for “the fallen.” It was R. Noson who emphasized and privileged the latter path, which involved renouncing despair—and this became definitive of Braslev subsequently. See Burger, Hasidic Nonviolence, 35-39. Deuteronomy 5:18; see Rashi ad loc. Ezekiel 1:24 (read as the Haftarah of Shavuot, after the Torah reading of the Sinaitic revelation in Exodus). Quoting Exodus 33:11. The translation as “friend” here is deliberate: RN instructed to talk to God as to a “true, good friend” (eyn emesn gutn fraynd)—B’zshilianski, Hishtapchut HaNefesh, Introduction. Also Green has read RN’s life in this way: Tormented Master, 265. For an account of the episode, see Sichot §153, and CM §49. The “Torah” that emerged is LM II 78. See Brayter’s Chalukei Nachal, which opens with the “the foundation of foundations” of RN’s teaching—also relating to descent, despair, and prayer. There too, it is a “revelation” by the foundational Tsaddik—see ibid. §7. The word “shalu’ach” appears later in the prayer. This concept is a major theme running through Brayter’s writings. Through RN’s Sipurei Ma’asiyot, “tales from ancient years,” mythic quests became central to the Braslev awareness. (See in particular Ora Wiskind-Elper, Tradition and Fantasy in the Tales of Reb Nahman of Bratslav (Albany: SUNY Press, 1998). The first story, “Of a Lost Princess,” in particular, resonates here. Through the telling of the tale, the individual’s experience is integrated into a “primordial,” that is, archetypal, and somehow familiar, narrative. This parallels Brayter’s contextualizing recent historical events into a cosmic metanarrative. Literally, “seclusion,” “secluding oneself,” in Hebrew; in colloquial Yiddish, it meant talking to God. See Moshe Idel, “Hitbodedut: On Solitude in Jewish Mysticism," in Einsamkeit: Archäologie der literarischen Kommunikation VI, ed. Aleida and Jan Assmann (München: Fink, 2000), 189-212. Use of the masculine pronoun is intentional: Reb Nakhmen said this to learned males, some of whom were highly well-versed in rabbinic Hebrew. Forms of the word tsa’ak (“to scream”) are found in many of the sources on hisboydedes. On LM as embodiment of and access point to the Tsaddik, see Shaul Magid, “Associative Midrash: Reflections on a Hermeneutical Theory in Likkutei MoHaRaN,” in God's Voice from the Void, 19. See Meir, “Shir Yedidot,” 206. ‘Retso vaShov.’ This core Hasidic concept borrowed the language describing the movement of the angels, Ezekiel 1:14. RN said one must be baki, learned and well-versed, in drawing closer to God both from states of closeness and estrangement: “running” (further) and “returning” (LM 6:4). Deuteronomy 4:32—read on Tisha beAv. And see following verse. Based on Ruth, 4:14. See the opening of Brayter’s “Song of Affection,” in She’erit, 198, and Meir, “Shir Yedidot,” 246. See Brayter’s Chalukei haNachal §7, for what is arguably the pinnacle of such writing. Implicit here is a particular reading of Likutei Moharan, one that identifies between the protagonist of that book, and its author. In this reading, Likutei Moharan is, in a sense, a spiritual egodocument, a homiletic self-portrait. By his disciples, Reb Nakhmen was identified quite clearly with, and seen to embody, the true Tsaddik of Likutei Moharan. See Chalukei haNachal §7:17, where Brayter makes this reading a cardinal of faith. See too Meir, Yeriot, 25, fn. 160. On the Tsaddik as redeemer of the individual, see Zvi Mark, Scroll of Secrets: The Hidden Messianic Vision of R. Nachman of Breslav, trans. Naftali Moses (Brighton, MA: Academic Studies Press, 2010). 68, fn 10. To the tsaddikim, the True Tsaddik shows that they have not yet begun to comprehend God’s infinitude. To those in the lowest of places he communicates that God is with them. See LM II 7; ibid, 68. See Mendel Piekarz, Chasidut Braslev: Prakim beChayey Mecholelah, biChtaveha uviSficheha (Jerusalem: Mossad Bialik, 1996), ch. 3; Green, Tormented Master, ch. 5; and Mark, Scroll of Secrets, ch. 1.2. The latter source is most germane here, addressing the students’ role in RN’s messianic project. On the central place of messianism generally in Braslev, see Hillel Zeitlin, “Messiah and the Light of the Messiah in Reb Nahman's Thought,” trans. Alyssa Quint, in God's Voice from the Void, 239-262. “Mayn fayrl vet shoyn tlien biz meshiekh vet kimen.” CM, §46. See Meir, Yeriot, 26, fn. 164. See CM §229, quoted in Mark, 71. The ‘covenant’ is a synonym for the phallus in the Zohar’s Divine body-map (see e.g. “Patach Eliyahu,” Tikunei Zohar, introduction)—and in Hasidic contexts such as this one, for its human analog—stamped with “the sign of the covenant,” i.e. circumcision. RN spoke in different contexts about the ‘general rectification’, in some places equating it with rectification of the sexual (“of the covenant”). This became correlated with reciting the ten chapters of Psalms. On the interconnection of these concepts, see Mark, Revealed and Hidden Writings, ch 4. See also Tikun HaKlali, introduction; L.M. 205, ibid II 92; Sichot, §141; Yehuda Liebes, “Ha-Tikkun ha-Kelali of R. Nahman of Bratslav and Its Sabbatean Links,” in Studies in Jewish Myth and Jewish Messianism, trans. Batya Stein (Albany: SUNY Press, 1993), 115-150. On the ten chapters of Psalms, see above. On the Tsiyun as crucial for the Jewish people’s rectification and redemption, see sources in Mark, Scroll of Secrets, ch. 6, in particular Tepliker’s addendum to the Chayey Moharan manuscript, cf. 199-200. Luban, Aviv. “A Narrow Path: Language and Longing for a Holy Place that is Lost.” In geveb, January 2019: https://ingeveb.org/articles/a-narrow-path. Luban, Aviv. “A Narrow Path: Language and Longing for a Holy Place that is Lost.” In geveb (January 2019): Accessed Apr 22, 2019. 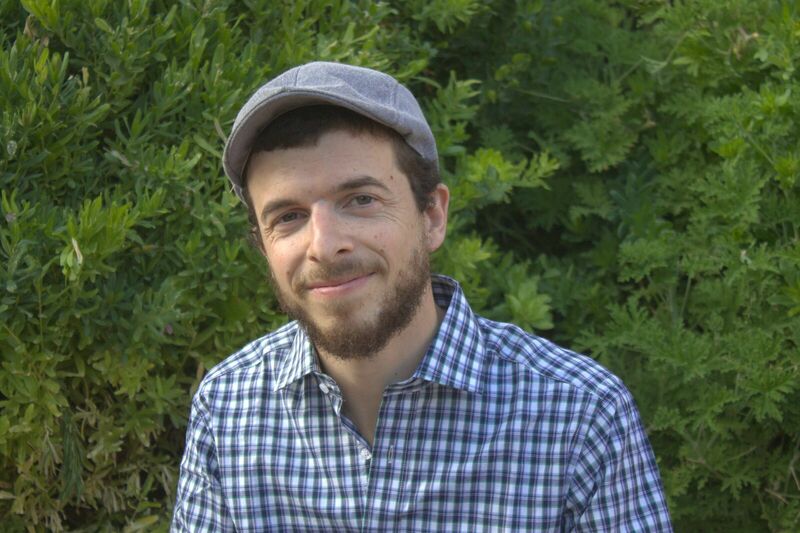 Aviv Luban is a PhD student at Bar Ilan University studying Hasidism, with a focus on the history and thought of the Polish Braslev movement.